EXTENDED AVAILABILITY FROM MEMORIAL WEEKEND THROUGH OCTOBER. 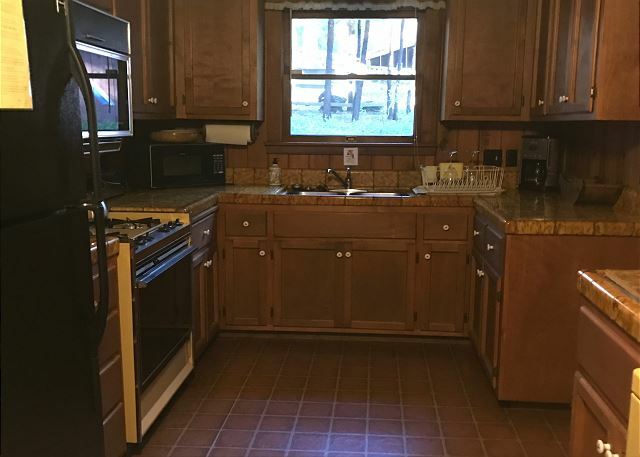 For those considering renting multiple units, this cabin is very near House at Twin Cedars 20..
Cabin Layout: Single Level. Living/Dining/Kitchen; 1 BA w/Shower only; 1 BR w/2 Twins + Queen; 1 BR w/King; 1 BA w/Tub only. Available summer only! This cabin has been well loved by the family that owns it. It exudes happy times. Location wonderful- easy walk to town, playground and lake. Only reason I am giving it 3 stars for general condition is that the living room rug and valences over the windows seemed to be holding a bit of dust and allergens. Would suggest they take down the unnecessary valences and install engineered wood floors throughout. Otherwise, very clean and tidy. Cabin wonderfully clean and attractive as always at arrival. My grandsons & I have rented this cabin 3 years in a row. We love the cozy atmosphere, the dorm style bedroom & the large front deck. I noticed the deck could use a sanding it was a bit rough. We really enjoyed our visit, our usual visit to the Hale Lani. It was comfortable and beautiful as always. Our only complaint was the slight discomfort arising from the high temperature during part of the visit. We had a wonderful time. My son only wishes he could have stayed a couple of more days to spend more time at the Lake with his daughter, play another game of mini golf, introduce his daughter to Columbia (stage coach, sarsaparilla, and pony rides if they still offer that), and ride the train in Jamestown. My husband and I enjoyed the concert on Saturday night at Eproson Park and wine tasting in Jamestown and downtown Twain Harte. The cabin was in a great location - lovely setting across from the Golf Course, nice walk to town, and a short drive (or long walk) to the Lake. On Sunday evening, five deer strolled through the property on their way to the golf course. The Stoesser family lovingly maintains the cabin as a lasting tribute to their parents. I have many great memories of my summers in Twain Harte as a child and bringing my children here. It is wonderful now to start creating new memories with my granddaughter. Beautiful open floor plan with a great deck. Their was only one drawback to the property itself - only one tiny shower (and the shower head dripped). We would love to come back year after year! Rented this cabin for the first time. Loved the location! The cabin was comfortable and fully equipped. We enjoyed eating out on the big deck. Plenty of seating! Appreciated the window air conditioner during the hot week. The only reason we can't rent again is the fact that one of the two bathrooms had no shower...only a bathtub. We had up to 7 people over the weekend and one shower just wasn't enough. Otherwise we absolutely loved this place!!! Had a great stay. I think we've rented this cabin now 8 summers in a row now, our family loves it. This was our family's seventh year in a row at this cabin. We love it. The location is perfect. It is located half way between the lake entrance and the mini golf course in town. We spend long hours at the lake, then come back and enjoy dinner on the deck. The kids then take a walk to town for golf. It's great. We'll be back next year. My daughter and I needed some R & R and this was the perfect place for it. 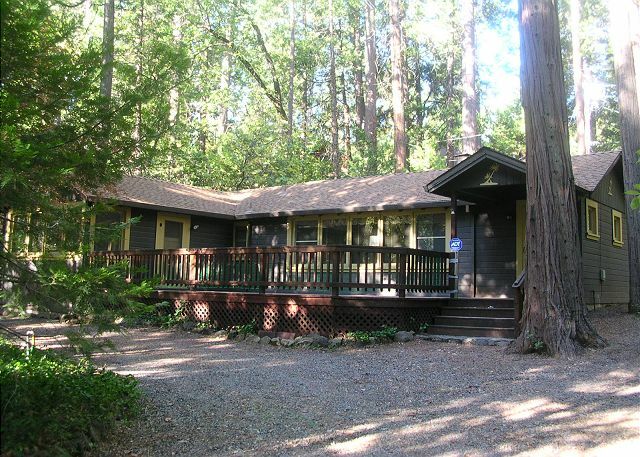 A large cabin in the woods of Twain Harte, quiet, peaceful, and walking distance to town. We loved seeing deer each morning on our walk. If you want to stay connected, there's wifi, but it's a great place to let go of the rest of the world! I would stay there again, for sure! We have been staying at various cabins in Twain Harte for more than 50 years and always enjoy it. We really enjoyed Hale Lani when we stayed there last year and were equally pleased this time. The location is great and the facilities verysatisfying. Our only complaint was the character and quality of the July 4th parade. It seems to be going downhill. I picked this location because we didn't have to many people in our party and it was perfect. Great Place would come back again. This is our 3rd year to Twain Harte. This cabin is a perfect for our family of 4. We loved the view of the golf course and it is only a few minutes drive from the lake. (My husband walked there.) It is very clean and cozy. We loved the AC unit and they even had Wifi! Management is great! Margie is wonderful to work with! We are going to make Twain Harte one of our yearly family trips!! We had some hot weather, but the shade and the ability to open doors and windows that allow cross ventilation made the cabin comfortable with or without the air conditioning unit. We found the cabin comfortable in all ways, and because it was vacation with no deadlines, etc., we found it easy to manage with four people and one shower (with the water shortage we could not justify trying out the wonderful bath tub. The new deck furniture was wonderful. We have rented approx. 30 different cabins in Twain Harte over the last 50+ years, and this one runs near the top of our list for a repeat visit. We really enjoyed the cabin this year more than ever. The Internet was a much appreciated touch! Can't wait to come back. Thank you. We love the cabin. Our third year in a row and we look forward to next year. Cabing had everything we needed, everything was in working order and very clean. It's a 2 min drive to the lake and overlooking golf course. Wish there was dishwasher, but we managed. We had another wonderful week at this cabin! It is in a great location, central to downtown and the lake. The deck is fantastic. The cabin stays cool and the AC unit works great. This is the perfect cabin for our family of 4 and we look forward to staying there next year! The lighting on the front porch is not enough. They only have the door light and a motion light. It was very hard to socialize at night.